A Metal-Oxide Semiconducting Field Effect Transistor is essentially a switch, and is the basis of most integrated circuits on the market today. Integrated circuits are the chips found in nearly all electronic devices, making MOSFETs one of the most important technology innovations of the last century. MOSFETs work by varying the resistance of current flow within a circuit. MOSFETs are a three-dimensional device comprised of three electrodes: the gate, the drain, and the source. The drain and source are connected to a body, which can be shared with other MOSFETs, but separated from each other by a channel. Further separating the metal or polysilicon gate from the drain and source is an insulator, comprising the “oxide” in the metal-oxide. 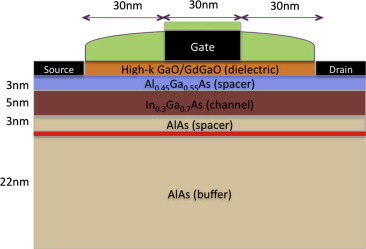 The width of the channel and the thickness of the gate are in the nanometer scale, but because MOSFETs have been around so long, they are often not considered nanotechnology. That being said, there is considerable room for nanotechnology innovations in current and future MOSFET technology. Nanomaterials such as graphene, gallium, carbon nanotubes, nanowires, and nano-magnetics are being studied for their ability to handle larger electrical charge on the gates while still maintaining other physical properties. As the channel and gate width of MOSFETs becomes smaller than 30nm, nanotechnology interventions will be foundational to innovations in chip manufacturing. New innovations in MOSFET technology will allow for more durable, more efficient, and smaller integrated circuits. The potential benefits of this technology are enhanced computing power and energy efficiency in electronic and digital devices. The risks of MOSFETS are ambiguous and difficult to identify. They have fundamentally changed society and the human condition, allowing for the advancement of society, increased productivity, and improved quality of life. All of these things have led to population increase and increased consumption. While improvements to MOSFET technology will increase resource conservation on a micro scale, they may prove to have created a number of risks and sustainability challenges on a macro scale. These issues range from resource consumption to waste generation, partly due to the fast pace of advancements of integrated circuit innovation.